The TCRβ chain constant domain contains an unusually elongated, solvent-exposed FG loop. This structural element forms one component of an αβ TCR cavity against which CD3εγ may abut to facilitate Ag-specific signaling. Consistent with this notion, in the present study we show that N15αβ TCR transfectants expressing a FG loop-deleted chain (βΔFG) stimulate less tyrosine protein phosphorylation than those bearing a wild-type β-chain (βwt) upon TCR cross-linking. Furthermore, coimmunoprecipitation studies suggest a weakened association between the CD3εγ heterodimer and the β-chain in TCR complexes containing the βΔFG variant. To further investigate the biologic role of the Cβ FG loop in development, we competitively reconstituted the thymus of Ly5 congenic or RAG-2−/− mice using bone marrow cells from βwt or βΔFG transgenic C57BL/6 (B6) mice. Both βwt and βΔFG precursor cells generate thymocytes representative of all maturational stages. However, βΔFG-expressing thymocytes dominate during subsequent development, resulting in an excess of βΔFG-expressing peripheral T cells with reduced proliferative and cytokine production abilities upon TCR stimulation. Collectively, our results show that the unique Cβ FG loop appendage primarily controls αβ T cell development through selection processes. The TCR is a multisubunit complex on the surface of T cells and functions to convey information about the surrounding environment to the signaling machinery inside the cell (1, 2). The TCR also provides critical signals necessary for the completion of thymocyte development (3). As thymocytes mature, the composition of their surface receptor changes; the pTα subunit is expressed in double-negative (DN)3 thymocytes along with the TCRβ chain to form the pre-TCR (4, 5). While it is currently a matter of debate as to whether the pre-TCR has a ligand, signaling through the pre-TCR triggers cessation of additional β-chain rearrangements, resulting in allelic exclusion (6, 7). The pre-TCR also signals proliferation and transition from the DN3 to DN4 developmental stages (8). Upon rearrangement, the mature TCRα chain replaces pTα, permitting assembly of the αβTCR in double-positive (DP) thymocytes (5, 9). Development of a second T cell lineage, the γδ T cells, does not depend on expression of the pre-TCR (reviewed in Ref. 8); this TCR is composed of rearranged γ- and δ-chains, which are equivalent to the β- and α-chains of the αβTCR, respectively (reviewed in Ref. 10). Signal transduction by the pre-TCR, the mature αβTCR, and the γδTCR is conducted by the noncovalently associated invariant CD3 subunits (10). Based on thymocyte development in CD3 subunit knockout animals, the development of both αβ and γδ T cell lineages is dependent on CD3ε. In particular, in the absence of CD3ε, thymic development is blocked at the early DN stage (11, 12), suggesting a critical role for CD3ε in pre-TCR signaling. Likewise, in the absence of CD3γ (13) or CD3ζ (14, 15, 16), thymocyte development in both the αβ and γδ lineages is compromised severely. However, in contrast to the αβTCR, neither the pre-TCR nor γδTCR requires CD3δ (10, 17). The stoichiometry of the αβTCR is thought to be one CD3εγ dimer paired with the TCRβ chain, one εδ dimer paired with the TCRα chain and a CD3ζζ homodimer (10). While less well-defined, the γδTCR appears to exist as a complex with two CD3εγ heterodimers and a single CD3ζζ homodimer. The pre-TCR may exist as a pTα/TCRβ, CD3εγ, CD3εδ, and CD3ζζ complex or perhaps with two CD3εγ dimers instead of one CD3εγ and one CD3εδ (10). The abundance of CD3γ transcripts in DN thymocytes compared with DP thymocytes suggests that CD3εγ dimers are preferentially expressed in DN thymocytes over CD3εδ dimers. The levels of CD3δ transcripts are approximately equal in DN and DP thymocytes (18); preferential formation of CD3εγ dimers over CD3εδ in DN thymocytes explains why the pre-TCR can function in the absence of CD3δ. The central role of CD3ε in all forms of TCR signaling suggests that the topology of CD3ε in relation to the clonotypic subunits is important in this process. Three-dimensional structures of the TCR (19, 20, 21, 22) have shown that the FG loop of the TCRβ chain exists as an elongated, rigid element forming a sidewall of a cavity created by the asymmetric disposition of Cα and Cβ domains, and whose size would encompass an unglycosylated Ig domain such as CD3ε (22). Indeed, Ab-blocking experiments confirmed that a CD3ε subunit lies in close proximity to the TCRβ chain FG loop (23). The role of this structure in TCR signaling was investigated by constructing transgenic (tg) mice whose TCRβ chain FG loop was deleted (βΔFG) (24, 25, 26). Initial analysis noted less efficient expression of βΔFG-containing TCRs in transfectants in vitro, but normal T cell development and TCR expression in tg T cells in vivo (24). It was later noted that the FG loop-deleted TCR Vβ8.2-Jβ2.1 chain paired less efficiently with the specific Vα14-Jα281 TCRα chain, resulting in a reduction of NK1.1 cells in these mice compared with the wild-type Vβ8.2-Jβ2.1 TCR (25). Our previous paper (26) using the N15TCR on a RAG-2−/− background to follow a single TCR identified further alterations in T cell development. In particular, we observed that pre-TCR function can be supported by the mutant βΔFG chain. On the other hand, negative selection is reduced in the absence of the FG loop and T cells carrying this deletion respond less well to cognate Ags. In this study, we have further delineated the role of the FG loop in mitogen-induced T cell proliferation and cytokine production in N15β chain tg mice. Biochemical analysis of transfectants expressing N15αβ TCRs with wild-type β-chain (βwt) or βΔFG chains shows that the βΔFG chains are more weakly associated with CD3εγ, offering one potential basis for the reduction in the above activation measurements. In addition, in a RAG-2−/− background, the pre-TCR containing a βΔFG chain signals the DN3 to DN4 transition less efficiently than does the pre-TCR containing a βwt chain. Nonetheless, when assayed competitively by coinjection in bone marrow (BM) chimeras, the FG loop-deleted tg progenitors are more proficient in repopulating the thymus and lymph node than their βwt chain tg counterparts. We conclude that the presence of the Cβ FG loop primarily regulates maturation of developing T cells through effects on selection. N15βwt and N15βFG loop-deleted mutant mice were generated as described previously (26). The mice were backcrossed for more than 10 generations onto a C57BL/6 (B6) background. B6, B6 Ly5.1, B6 RAG-2−/−, and BALB/c mice were purchased from Taconic Farms. To create RAG-2−/− background N15β tg mice, N15βwt RAG-2+/+ and N15βΔFG RAG-2+/+ mice were bred with B6 RAG-2−/− mice for two generations. 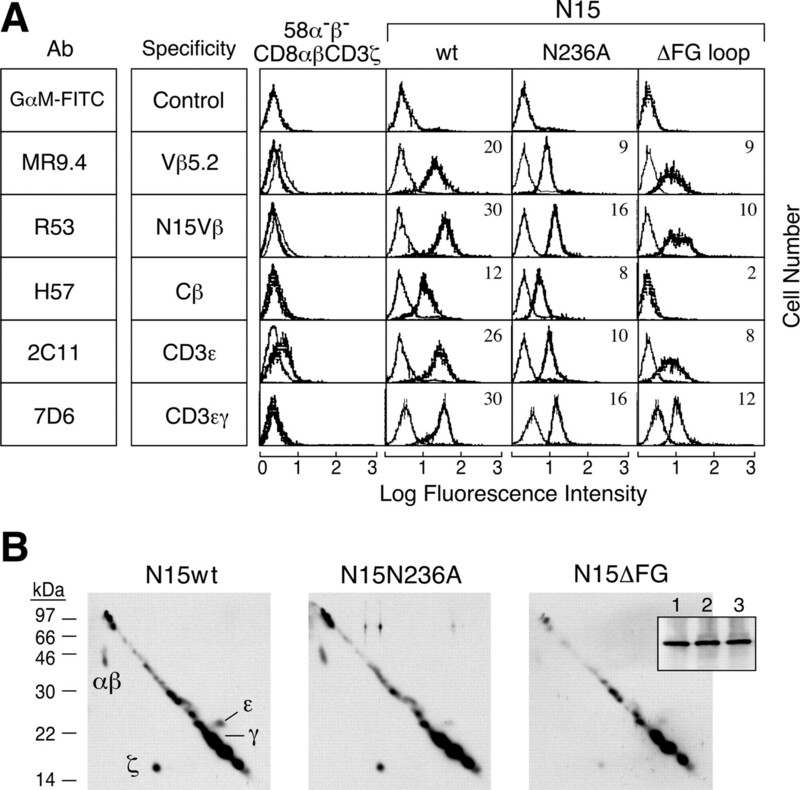 For N15α,βΔFG TCR tg RAG-2−/− mice, the N15βΔFG mice were crossed with B6 N15α tg mice and then to B6 RAG-2−/− mice. The N15αβ RAG-2−/− mice were generated as described previously (27). All lines were maintained under specific pathogen-free conditions at the animal facility of Dana-Farber Cancer Institute under a protocol reviewed and approved by the Animal Care and Use Committee. The following mAbs were used: FITC-conjugated anti-Ly5.2 (104), PE-, PE-Cy5- or PE-Cy7-conjugated anti-CD4 (H129.19), FITC-, PE-Cy5-, or allophycocyanin-conjugated anti-CD8α (53-6.7), PE-Cy5-conjugated anti-TCR Cβ (H57-597), PE- or biotin-conjugated anti-Vβ5.1, 5.2 (MR9.4), PE-conjugated anti-CD25 (PC61), FITC-conjugated anti-CD44 (IM7), FITC- or PE-conjugated anti-Vβ 5.1, 5.2 (MR9.4), FITC-conjugated anti-CD69 (H1.2F3), FITC-conjugated anti-CD24 (HSA, M1/69), FITC-conjugated anti-CD5 (53-7.3), FITC-conjugated PNA, and PE-Cy5 or allophycocyanin-Cy7-conjugated streptavidin (BD Pharmingen). For flow cytometry, single-cell suspensions of thymocytes or lymph node (LN) cells were prepared at 5 × 106 cells/ml in PBS containing 2% FCS and 0.05% NaN3. Those cells were triple or five-color stained with the Abs at saturating concentrations according to standard procedures. A FACScan (BD Biosciences) and CellQuest software were used for analysis of triple stained samples, and FACSAria and FlowJo software (Tree Star) were used for five-color samples. Dead cells were excluded from the analysis by forward and side scatter gating. BM cells were prepared from the tibia and femur of 2- to 3-mo-old N15βwt or N15βΔFG mice. T cells were eliminated from total BM cells by CD4− and CD8− negative separation using specific mAbs and magnetic beads. Equal numbers (5 × 106) of BM cells from N15βwt and N15βΔFG mice were mixed and i.v. injected into irradiated (500 rad) B6 Ly5.1 mice or unirradiated B6 RAG-2−/− mice. As controls, 5 × 106 BM cells from N15βwt or N15βΔFG alone were injected. Four weeks after the injection, recipient mice were sacrificed, and thymus and LN cells were analyzed by FACS for donor-derived Ly5.2+ cells. Competition of N15βwt cells and N15βΔFG cells was judged by the ratio of MR9.4+H57+ (wild-type N15β T cells) to MR9.4+H57− (FG loop-deficient N15β T cells). CD8+ cells were sorted from N15βwt or N15βΔFG LN cells. Sorted cells (2 × 105/well) were cultured for 48 h in the presence of complete RPMI 1640 medium with or without plate bound anti-CD3ε (145-2C11, 5 μg/ml), anti-CD3 plus anti-CD28 (37.51, 10 μg/ml), Con A (2 μg/ml) plus irradiated spleen cells (2 × 105/well), or PMA (50 ng/ml) plus ionomycin (200 ng/ml). One microcurie per well of [3H]thymidine (MP Biomedicals) was added for the last 18 h of culture, and the incorporated radioactivity was measured by scintillation counter. FACS-sorted LN CD8+ cells (2 × 105/well) were cultured with irradiated spleen cells (2 × 105/well) from syngeneic C57BL/6 mice or allogeneic BALB/c mice for 72 h in complete RPMI 1640 medium, and 1 μCi/well of [3H]thymidine was added for the last 18 h of the culture. Cells were harvested and incorporated radioactivity was measured. Cytokine production was induced under the same culture conditions used for proliferation assays (see Proliferation assay of T cells), except that the cell concentration was 5 × 105/well. Supernatants were collected from 46 h cultures and kept at −80°C until used for cytokine multiplex analysis (Luminex). CD8+ cells from LN of N15βwt and βΔFG tg mice were prepared by depletion of CD4+ and B220+ (RA3-6B2) cells using magnetic beads. Purified CD8+ cells (2 × 105/well) were incubated in an anti-CD3ε- and anti-CD28-coated plate for 15 h with various reagents that inhibit TCR signaling pathways. The following reagents were used: PP2 (10 μM), staurosporine (1 μM), Ly249002 (50 μM), wortmannin (100 nM), BAPTA-AM (25 μM), FTI-277 (40 μM), Raf1 (5 μM), and U73122 (0.5 μM). Golgi Plug reagent (BD Pharmingen) was added to the culture in the last 2 h of incubation, and cells were stained for cell surface CD8 and Vβ5 and for intracellular IFN-γ to test inhibition of IFN-γ production by CD8+Vβ5+ cells. The N15βN236A (Cβ glycan addition site N236 mutated to A) and N15βΔFG (deletion of 14 Cβ FG loop region residues, aa 219–232) mutants were generated by PCR using N15βwt cDNA as a template, and the mutant constant regions subcloned into the expression vector pSH encoding the entire N15 Vβ and nonmutant component of the N15β C region to generate pSH-N15βN236A and N15βΔFG. To generate stable T cell transfectants, the N15 TCR wt or variant hybridomas were established by cotransfection of 25 μg of BglII/SalI-linearized pBJNeo-N15α and 10 μg of SalI-digested pSH-N15β into the TCR− murine T cell hybridoma 58α−β−CD8αβ+ cell line (28) by electroporation. Forty-eight hours after transfection, the cells were plated at 2 × 104 cells/well in 24-well plates in selection medium (complete RPMI 1640 medium plus 0.1 mg/ml G418 and 2 mg/ml hygromycin). Two weeks later, the surviving clones were analyzed by FACS using the MR9.4 mAb. The cells expressing the highest levels were pooled to avoid clonal bias, and the polyclonal populations were sorted on several occasions to maintain comparable TCR surface expression levels. Cell surface biotinylation was performed by a modification of a described procedure (Current Protocols in Immunology). Briefly, 2 × 107 cells were suspended in PBS containing Ca2+, Mg2+, and sulfo-NHS-biotin (50 μg/ml; Pierce) at 1 × 107 cells/ml and incubated with gentle shaking at 4°C for 30 min. The cells were then washed and lysed (1% digitonin in TBS supplemented with 10 μg/ml aprotinin, 10 μg/ml leupeptin, and 1 mM PMSF). The lysates were immunoprecipitated with 7D6 (anti-mouse CD3εγ mAb) coupled to GammaBind Plus Sepharose (Pharmacia Biotech). Immunoprecipitates were subjected to two-dimensional nonreducing/reducing diagonal SDS-PAGE and transferred onto nitrocellulose membranes. The membranes were incubated with HRP-conjugated streptavidin (ICN) in PBS containing 0.1% BSA and 0.1% Tween 20 at 37°C for 2 h. After washing, the blots were developed using ECL (Amersham Biosciences). CD3ζ expression was analyzed by immunoprecipitation of the postnuclear supernatants with 1ζ3A1 (anti-mouse CD3ζ mAb)-coupled GammaBind Plus Sepharose, followed by Western blotting with Ab 387 (rabbit anti-mouse CD3ζη). Immunoprecipitation with rabbit antisera against Zap70 (gift from J. Bolen, DNAX, Palo Alto, CA) was performed as described previously (29, 30). In brief, 1 × 107 cells were stimulated by cross-linking the TCR with 20 μg/ml biotinylated anti-CD3ε and 200 μg/ml streptavidin (Sigma-Aldrich) at 37°C for the indicated times. Cells were then lysed (1% Nonidet P-40, 20 mM Tris-HCl (pH 7.5), 150 mM NaCl, 10 μg/ml aprotinin, 10 μg/ml leupeptin, 1 mM PMSF, 1 mM Na3VO4, and 10 mM EDTA). Postnuclear lysates were mixed with 20 μl of GammaBind Plus Sepharose preincubated with rabbit antisera against Zap70. Immunoprecipitated samples were subjected to SDS-PAGE and transferred to a nitrocellulose membrane, then incubated with 4G10 mAb (anti-phosphotyrosine; gift from T. Roberts, Dana-Farber Cancer Institute, Boston, MA) or rabbit anti-sera against Zap70. To assess the capacity of the transfectants to be activated by the VSV8 peptide, R8 B cells were irradiated at 3200 rad then incubated with various peptide concentrations ranging from 10−9 to 10−4 M for 2 h at 37°C. A total of 1 × 105 transfectants was then incubated with peptide-loaded R8 cells in medium supplemented with 10 ng/ml PMA. After 24 h, culture supernatants were harvested, and IL-2 concentrations in the supernatants were determined by MTT assay using the IL-2-dependent CTLL-20 cell line and recombinant human IL-2 as standards. LN cells from N15α,βΔFG RAG-2−/− or N15αβ RAG-2−/− mice were incubated with 10−5 M VSV8 cognate peptide at 4°C for 5 min, spun down, and then incubated at 37°C for the indicated time. Cells were chilled on ice and lysed in 1% Nonidet P-40, 50 mM Tris-HCl (pH 7.5), and 150 mM NaCl plus phosphatase and protease inhibitors. Lysates were run on SDS-PAGE and analyzed by Western blot with anti-Pan Erk1/2 (p42/44) and anti-phospho Erk1/2 (Cell Signaling Technology). We previously described T lineage development in B6 background mice tg for the N15 TCRβ chain (N15βwt) compared with mice tg for the N15 β-chain in which the Cβ FG loop (aa 219–232) was deleted (N15βΔFG) (26). The N15 β-chain is derived from a CD8+ cytotoxic T cell clone expressing a TCR specific for the vesicular stomatitis virus nucleoprotein aa 52–59 (VSV8) bound to the MHC class I H-2Kb molecule (28, 31). Cell surface TCR expression levels on T cells harboring the mutant N15βΔFG chain are similar to those of N15βwt-expressing cells. Flow cytometric analysis showed that early T cell development in N15βΔFG mice as evidenced by the transition from the CD44−CD25+ DN3 to the CD44−CD25− DN4 stage is similar to that of N15βwt mice. However, the CD4/CD8 profiles of thymocytes and LN cells show a subtle but significant increase of CD8 single-positive (SP) thymocytes and CD8+ peripheral T cells in N15βΔFG mice, suggesting enhanced positive selection (Fig. 1⇓) (26). Consistent with this finding is the result of analysis of maturation markers on CD8 SP thymocytes. N15βΔFG CD8 SP thymocytes express slightly higher levels of CD69 and CD5 but slightly decreased CD24 and PNA, all consistent with increased maturation/positive selection (Fig. 1⇓). To further characterize these alterations in mice lacking the TCR βFG loop, we have conducted competitive thymic reconstitution experiments in which BM cells from the N15βwt and N15βΔFG tg mice were mixed and used to create chimeras. We reasoned that compensatory mechanisms in the βΔFG mutant mice could mask the effect of the FG loop deletion during development. However, such compensatory mechanisms are not possible when the mutant BM cells are forced to undergo competitive reconstitution in an irradiated Ly5 congenic or RAG-2−/− host. Increased generation of CD8+ SP thymocytes in N15βΔFG mice. Thymocytes were prepared from N15βwt and N15βΔFG mice and stained for CD4 and CD8 and maturation markers, CD69, CD24, CD5, and PNA. The percentages of DN, DP, and SP subsets are indicated in the CD4/CD8 dot plot. Histograms represent the indicated markers on CD8SP cells gated as shown in the dot plot. The numbers in each histogram are the mean fluorescence intensity. Thus, we have used competitive thymic reconstitution to directly compare the ability of N15βΔFG and N15βwt precursor cells to generate T cells. To this end, equal numbers of BM cells from N15βwt mice and N15βΔFG mice were mixed and i.v. injected into B6 RAG-2−/− or irradiated B6 Ly5.1 mice. BM cell transfer from N15βwt mice or N15βΔFG mice alone served as controls. Donor-derived cells start to appear in the recipient thymus ∼2 wk after BM cell injection, and most thymocytes are donor-derived (>90% Ly5.2+ cells in a B6 Ly5.1 thymus) 3–4 wk after the injection (data not shown). For example, 77–96% of recipient thymocytes are Ly5.2+ N15βwt- or N15βΔFG-derived cells at 17 days after BM injection (data not shown), and DN, DP, and SP populations were observed in both cases. Thus, thymic reconstitution by N15βΔFG BM is not delayed compared with reconstitution by N15βwt BM. Fig. 2⇓ shows an example of five-color FACS analysis of thymocytes from chimeras 4 wk after BM transfer. Donor-derived Ly5.2+ cells were analyzed for CD4 and CD8 expression to determine generation of thymocyte subsets. Competitive thymic reconstitution by N15βwt and/or N15βΔFG BM cells. Ly5.2 BM cells (5 × 106) from N15βwt and N15βΔFG mice were injected together or individually into irradiated B6 Ly5.1 mice. Four weeks after injection, total thymocytes were five-color stained with anti-Ly5.2-FITC, anti-CD4-PE-Cy7, anti-CD8-allophycocyanin, anti-TCR Cβ (H57)-PE, anti-Vβ5 (MR9.4)-biotin, and streptavidin-allophycocyanin-Cy7. For the analysis, dead cells were excluded by forward light scatter/side scatter (FSC/SSC), and Ly5.2-positive cells were gated to analyze donor-derived cells. CD4/CD8 profiles of Ly5.2+ thymocytes are shown. The percentages of each subset are indicated. Ly5.2+ DN, DP, and CD8 SP thymocytes were further analyzed for expression of MR9.4 (anti-Vβ5) and H57 (anti-Cβ). MR9.4low/H57low and MR9.4+/H57+ cells are N15βwt-expressing cells while MR9.4low/H57− and MR9.4+/H57− are N15βΔFG-bearing cells. Numbers indicate the percentages of cells in each subset. To distinguish the N15βwt- and N15βΔFG-expressing cells in mixed BM chimeras, anti-Vβ5 (MR9.4) and anti-Cβ (H57) were used. Because the N15β chain contains Vβ5.2 (32) and the FG loop is the epitope for H57 (22, 33), the N15βwt-expressing cells are detectable as MR9.4+H57+ and N15βΔFG-expressing cells as MR9.4+H57−. As shown in Fig. 2⇑, DN, DP, and SP thymic subsets were all reconstituted by BM cells from N15βwt and N15βΔFG tg mice injected singly or together. A higher percentage of CD8 SP thymocytes is generated by N15βΔFG BM than by N15βwt BM, and the percentage of CD8 SP thymocytes generated by mixed BM cells is dominated by the ΔFG type cells. Reconstitution of the other thymic subsets is similar in the three types of chimeras. N15βΔFG BM cells generate H57 negative thymocytes almost completely; the small number of H57 positive T cells most likely results from endogenous β-chain expression due to incomplete β-chain allelic exclusion (see Discussion and Ref. 34). The mixed BM generates both H57-positive wild-type β- and H57-negative βΔFG cells in all subsets (Fig. 2⇑ and Table I⇓). In the DN population generated from the mixed BM, the percentages of H57-positive and -negative cells in MR9.4 low (MR9.4low) cells are similar (MR9.4lowH57+ = 25.8% and MR9.4lowH57− = 27.8% in the second row of triple dot plots for Fig. 2⇑). However, H57-negative N15βΔFG cells are dominant in all MR9.4 high (MR9.4+) thymic subsets and in LNs (Table I⇓). The DP cells expressing intermediate TCR levels in the mixed chimera resemble those of the N15βΔFG chimera (third row of triple dot plots), suggesting that the advantage of βΔFG progenitors in thymic development occurred before this. 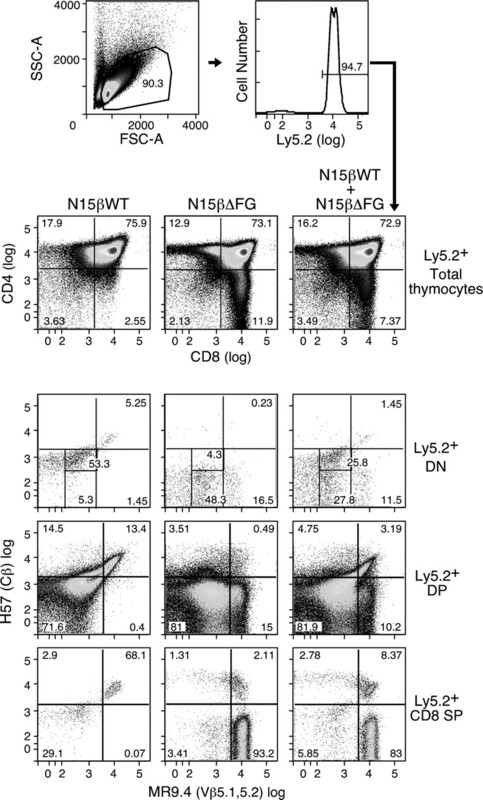 The preferential development of N15βΔFG T cells compared with N15βwt T cells in the mixed BM chimeras is more prominent in the thymic CD8 SP and LN CD8+ cells than in DP and thymic CD4 SP populations. The CD4+ cells are less affected than the CD8+ cells since the N15β-chain is derived from the class I-restricted N15 TCR and is expressed more in CD8+ than in CD4+ thymocytes and T cells. The generation of CD8 SP thymocytes is greatly enhanced by the deletion of the FG loop. Thus, T cell precursors expressing βΔFG loop subunits have an advantage over those expressing βwt subunits during thymic maturation (Fig. 2⇑, Table I⇓). In addition, the βΔFG T cells are more dominant in the periphery (Table I⇓, Ref. 26 , and data not shown). This βΔFG T cell skewing is most likely due to enhanced survival of these thymocytes compared with βwt chain-containing thymocytes, although an improved emigration from the thymus is not excluded. Earlier BrdU studies revealed no increased proliferation of thymocytes from N15βΔFG vs N15βwt tg mice, however (26). To further assess the function of the Cβ FG loop in early T cell development, we analyzed DN cells in TCRβ tg mice in a RAG-2−/− background; these mice express pTα but not the mature TCRα chain, allowing analysis of the function of the Cβ FG loop in pre-TCR expression and signaling. TCRβ chain expression begins at the CD44−CD25+ DN3 stage (18). In these cells, the β-chain associates with pTα instead of the mature TCRα chain. Signals through the pre-TCR facilitate proliferation and development from the DN3 to DN4 stages. As shown previously (26) and in Fig. 3⇓B, the ratio of DN4 to DN3 is similar for N15βwt and N15βΔFG tg thymocytes on a B6 RAG+/+ background. In the RAG-2−/− background, however, the N15βΔFG DN4:DN3 ratio is lower than that in N15βwt mice (Fig. 3⇓B). DN thymocyte development in B6 RAG-2−/− mice is arrested in DN3, so the ratio of DN4 to DN3 in B6 RAG-2−/− mice is very low. Consequently, use of this genetic background is more sensitive for following early developmental changes. In addition, endogenous nontransgenic rearrangements cannot confuse the analysis. Note that both the N15βwt RAG-2−/− and N15βΔFG RAG-2−/− mice have comparable numbers of DP cells (Ref. 26 and data not shown), suggesting that the signaling capacity of pre-TCRs containing βΔFG chains is adequate to support the DN to DP transition. Nevertheless, in the RAG-2−/− background, the βΔFG mutation results in an incomplete block in the DN3 to DN4 transition (Fig. 3⇓A). The transition from CD44−CD25+ (DN3) to CD44−CD25− (DN4) thymocytes is reduced in N15βΔFG RAG-2−/− mice. Total thymocytes from N15βwt RAG-2−/− and N15βΔFG RAG-2−/− mice were stained with anti-CD4, anti-CD8, anti-CD25, and anti-CD44. The CD44/CD25 profiles of CD4−CD8− DN cells are shown in A. The percentages of cells in each quadrant are indicated. The ratio of DN4:DN3 cells in N15βwt, N15βΔFG, and C57BL/6 mice are shown in the left panel of B. The right panel shows the ratio of DN4/DN3 from comparable mice on a RAG-2−/− background mice (n = 4–7). To assess the functional role of the Cβ FG loop in mature T cells, we tested the responsiveness of N15βΔFG T cells to various stimuli in vitro. First, CD8+ and CD4+ T cells purified from LNs were stimulated with anti-CD3ε (2C11), anti-CD3ε plus anti-CD28, Con A, or PMA plus ionomycin and their proliferation assayed by [3H]thymidine incorporation. Proliferative responses of both CD8+ (Fig. 4⇓) and CD4+ (data not shown) N15βΔFG cells are approximately half the magnitude of those of N15βwt cells when stimulated with anti-CD3ε, anti-CD3ε plus anti-CD28, or Con A (Fig. 4⇓A). PMA plus ionomycin stimulation produces a strong proliferative response in both N15βwt and N15βΔFG T cells, and the proliferation of the N15βΔFG T cells is similar or even a little higher than that of N15βwt T cells (Fig. 4⇓A). Impaired proliferation and alloreactivity of N15βΔFG T cells. A, CD8+ cells (2 × 105) were purified from N15βwt or N15βΔFG LN cells by FACS sorting and stimulated as indicated for 48 h. [3H]Thymidine was added for the last 18 h, and T cell proliferation was judged by [3H]thymidine incorporation. Mean and SD of triplicate cultures are shown. ▦, N15βwt; ▪, N15βΔFG CD8+ cells. Results are representative of four independent experiments. B, CD8+ cells (2 × 105) purified from N15βwt or N15βΔFG LN cells were cocultured with irradiated C57BL/6 (H-2b) spleen cells (2 × 105) or BALB/c (H-2d) spleen cells (2 × 105) for 3 days, and [3H]thymidine incorporation was measured as in A. Mean and SD of triplicate cultures are indicated. Results are representative of four independent experiments. Next, we assessed the response of N15βtg T cells to alloantigens. Although N15αβ TCR-bearing T cells are restricted by the Kb molecule and do not have detectable alloreactivity (M. Touma and E. L. Reinherz, unpublished observations), T cells obtained from N15βtg mice on a B6 background pair with endogenous TCRα chains to display alloreactivity. In particular, N15βwt tg T cells are alloreactive for H-2d (Fig. 4⇑B). However, compared with N15βwt CD8+ T cells, the responsiveness of N15βΔFG CD8+ T cells to H-2d spleen cells is diminished significantly (Fig. 4⇑B). These findings suggest a clear deficit in TCR-triggered activation in N15βΔFG-expressing mature T cells. To further analyze T cell function, we compared the IFN-γ production by CD8+ T cells from N15βwt and N15βΔFG mice. LN T cells were incubated on anti-CD3ε-coated plates and IFN-γ-producing cells assessed by intracellular IFN-γ staining and FACS analysis. The number of IFN-γ+ cells in N15βwt cultures is 3- to 10-fold more than the number in the N15βΔFG cultures (data not shown). To confirm this analysis and to examine production of other cytokines in N15βwt and N15βΔFG T cells, we collected supernatants from N15βwt or N15βΔFG T cells stimulated with either anti-CD3ε plus anti-CD28, Con A, or PMA plus ionomycin for 2 days and performed cytokine Luminex assays. In these assays, IL-1α, IL-1β, IL-2, IL-3, IL-4, IL-5, IL-6, IL-10 IL-12p40, IL-12p70, IL-13, IL-17, GM-CSF, IFN-γ, TNF-α, MCP-1, RANTES, and KC were examined (Fig. 5⇓). Those cytokines whose concentrations were <50 pg/ml were excluded from the figure. 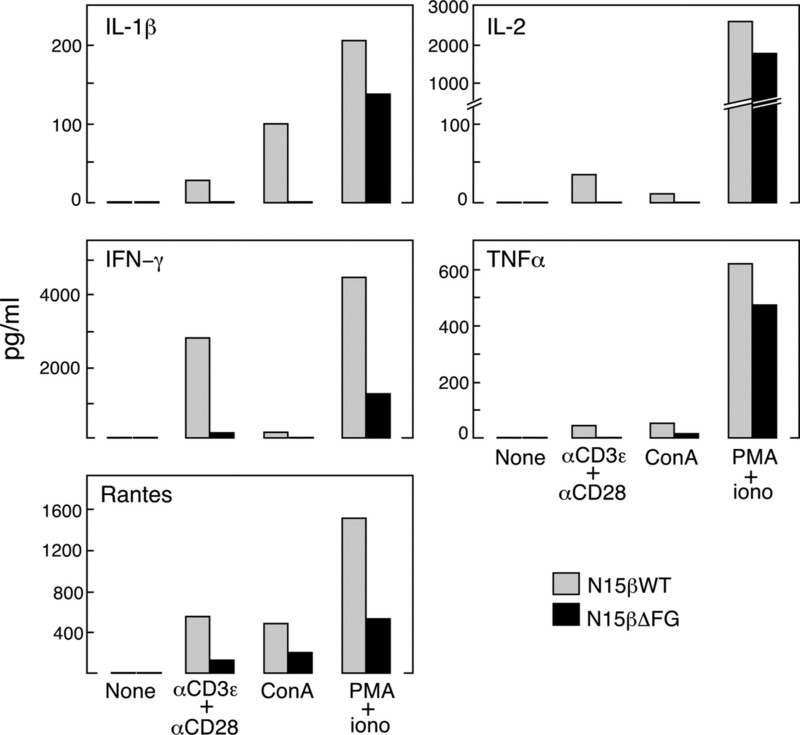 IL-1β, IL-2, IFN-γ, TNF-α, and RANTES production by stimulated N15βΔFG T cells is lower than production by N15βwt T cells. Although PMA plus ionomycin stimulation does not yield clear differences in the proliferation assay (Fig. 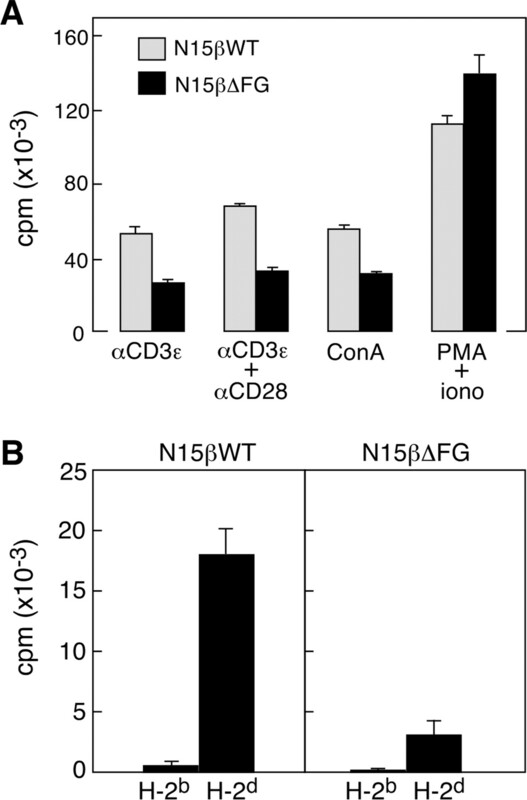 4⇑A), production of RANTES and IFN-γ is impaired in the N15βΔFG-expressing cells. Impaired cytokine production of N15βΔFG T cells. CD8+ cells (5 × 105 cells/200 μl/well) were purified from N15βwt or N15βΔFG LN cells by FACS sorting and stimulated as indicated for 46 h. Culture supernatants were harvested, and cytokines were analyzed by multiplex assay (Luminex). ▦ and ▪ represent N15βwt and N15βΔFG cells, respectively. Given that the N15βΔFG T cells display obvious defects in proliferation and cytokine production, we compared signaling pathways in N15βΔFG and in N15βwt T cells by using various inhibitors in vitro and measuring the effects of each reagent on intracellular IFN-γ production revealed by flow cytometry. As shown in Fig. 6⇓, PP2 (target = c-src), staurosporine (target = protein kinase C), Ly249002 (target = PI3K), wortmannin (target = PI3K), BAPTA-AM (target = Ca2+), and U73122 (target = phospholipase C) almost completely inhibit IFN-γ production in both N15βwt and N15βΔFG T cells stimulated with anti-CD3ε plus anti-CD28. IFN-γ production in N15βΔFG and N15βwt T cells is partially inhibited by FTI-277 (target = K-ras) or Raf1 (target = Raf). Although the scales (reflected in y-axis) of the N15βwt and N15βΔFG responses are different, the former being 5- to 10-fold greater than the latter, the patterns of inhibition are very similar. We further investigated the effect of these inhibitors on the anti-CD3ε- plus anti-CD28-induced expression of CD69 or CD25 in N15βwt and N15βΔFG T cells. The effect of some reagents on the induction of CD69 or CD25 was different from that on IFN-γ production: PP2, staurosporine, BAPTA-AM, and U73122 almost completely inhibited expression of CD69 and CD25; Ly249002 and wortmannin showed weak inhibitory effects; and FTI-277 or Raf1 have no observable effect. Nonetheless, the patterns of inhibition of CD69 and CD25 expression by these reagents were comparable for both N15βwt and N15βΔFG T cells (data not shown). These data suggest that the intracellular signal pathways are largely identical in βΔFG and βwt T cells with the former attenuated relative to the latter. 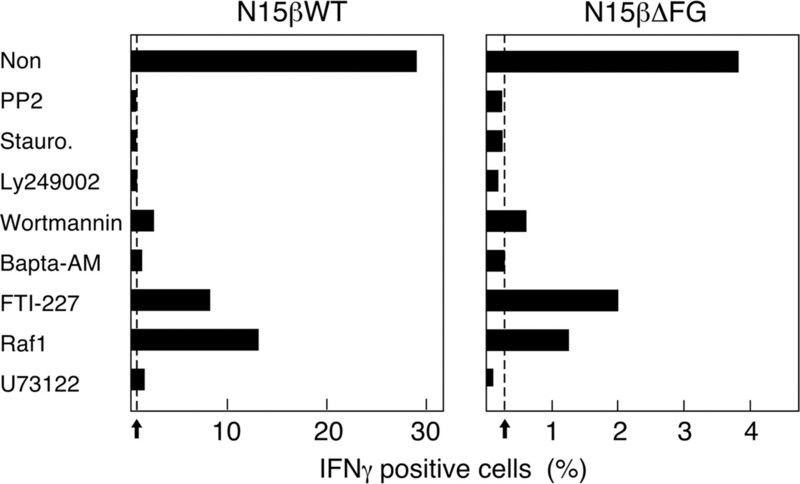 Comparison of pharmacologic inhibition of IFN-γ production in N15βwt and N15βΔFG T cells. LN cells (2 × 105) were prepared from N15βwt and N15βΔFG mice and incubated on anti-CD3ε- plus anti-CD28-coated plates with indicated reagents for 15 h. Golgi Plug reagent was added for the final 2 h of incubation. Cells were surface stained with anti-CD8 and MR9.4, then stained for intracellular IFN-γ. The MR9.4+CD8+ IFN-γ-producing cells were analyzed by flow cytometry. Samples were gated as live cells by forward light scatter vs side scatter. The results are representative of three independent experiments. The arrow and dotted line represent the background values for unstimulated cell cultures. The signals induced by TCR stimuli are communicated to the cell interior via the CD3 subunits (10, 35). Given that the Cβ FG loop and the glycan attached at CβN236 form one wall of a TCR cavity within or adjacent to which the CD3ε of a CD3εγ heterodimer might bind, deletion of either the glycan addition site at N236 (by an Asn to Ala mutation, N236A) or the FG loop would likely diminish the strength of the association between the αβTCR and the CD3εγ heterodimer. To test this possibility, N15wt-, N15N236A-, and N15ΔFG TCR-expressing cell lines were generated. The parental 58α−β−CD8αβ+CD3ζ T cell line (28) was cotransfected with a wild-type N15α-chain cDNA and either wild-type or mutant N15β-chain cDNAs. As shown in Fig. 7⇓A, compared with the parental cell line, all transfectants express reactivity with the Vβ5.2-specific mAb MR9.4 and the N15β chain anti-clonotype mAb R53 (28), although the fluorescence intensity in N15N236A and N15ΔFG cells is 2- to 3-fold lower than in βwt cells. As expected, the H57 Cβ FG loop-specific mAb selectively binds the N15wt, as well the N15N236A variant, but is unreactive with N15ΔFG. The level of surface CD3ε as detected by the 2C11 mAb that recognizes CD3ε in the context of both CD3εγ and CD3εδ dimers, as well as by 7D6 that selectively detects CD3εγ, is slightly lower in both the N15N236A and N15ΔFG transfectants. Analysis of N15wt, N15N236A, and N15ΔFG transfectants. A, FACS analysis of N15αβ wt and mutant transfectants. The TCR surface expression on N15wt or mutant transfectants was examined by indirect immunofluorescence staining using the specified mAbs and species-specific secondary Abs. The dark curve represents specific staining with mAb, and the light curve corresponds to background staining (second step Ab alone). Histograms were compiled from a minimum of 10,000 cells. The geometric peaks of the fluorescent intensities are presented. B, Biochemical analysis of the surface TCR complex on N15wt, N15N236A, and N15ΔFG cells. Surface-biotinylated transfectants (2 × 107) were lysed with 1% digitonin buffer, and lysates were subjected to immunoprecipitation with the anti-CD3εγ mAb 7D6. The immunoprecipitates were then separated by two-dimensional nonreducing/reducing SDS-PAGE. Biotinylated proteins were detected by streptavidin. Inset, N15wt (lane 1), N15N236A (lane 2), and N15ΔFG cells (lane 3) (2 × 107) were lysed, and samples were immunoprecipitated with anti-mouse CD3ζ mAb, 1ζ3A1. After nonreducing SDS-PAGE, CD3ζ proteins were visualized by Western blotting with the anti-CD3ζ heterosera. Results are representative of four independent experiments. The 7D6 immunoprecipitates of surface biotinylated transfectants were resolved by two-dimensional nonreducing/reducing gels and analyzed by Western blotting. As shown in Fig. 7⇑B, in N15wt cells, the 7D6 mAb coprecipitates CD3εγ, as well as TCRαβ and CD3ζζ. A similar pattern is observed for N15N236A with a modest reduction of the intensity of the CD3ε spot. In contrast, in N15ΔFG cells, only a very minor fraction of TCRαβ and CD3ζζ dimers remains coassociated. That there is less associated CD3ζζ homodimer in N15ΔFG is not due to decreased expression of ζ protein in N15ΔFG compared with N15wt as shown by analysis of anti-ζ Western blots of total cell lysates (Fig. 7⇑B, inset). These results imply that the Cβ FG loop deletion weakens the association between the CD3εγ dimer and the other TCR subunits. To next determine the functional consequences of these alterations on biochemical association, the effect of TCR cross-linking by anti-CD3ε mAbs on induced tyrosine phosphorylation was examined. Fig. 8⇓A shows that, upon stimulation, there is rapid tyrosine phosphorylation of multiple proteins associated with active Zap70 in antiphosphorylation immunoblots of Zap70 immunoprecipitates from N15wt transfectants. The phosphorylated proteins include Zap70 at 70 kDa (whose identity was confirmed by stripping the 4G10 blot and reprobing with anti-Zap70 heteroantisera), as well as prominent bands at 145, 56, 46, 36, 25, 23, and 21 kDa. Although the identity of these substrates remains to be proven, their sizes are consistent with phospholipase Cγ, lck, shc, linker for activation of T cells, CD3ε, and CD3ζ, respectively. 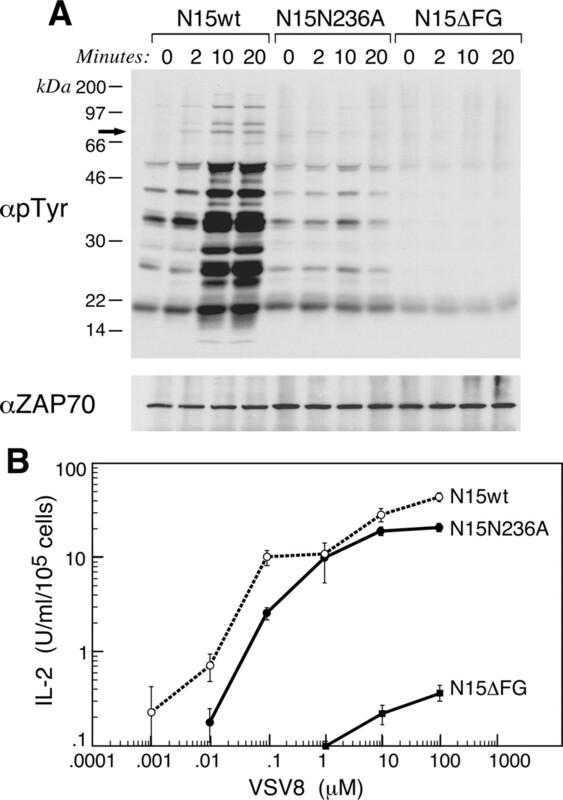 However, in N15N236A, the phosphorylation of Zap70 and these proteins is reduced in magnitude and more transient in duration and is essentially undetectable in N15ΔFG. The Cβ FG loop deletion markedly diminishes TCR signaling function of transfectants. A, Analysis of TCR-stimulated protein-tyrosine phosphorylation of intracellular substrates in N15wt, N15N236A, and N15ΔFG transfectants. N15wt and mutant cells (1 × 107) were stimulated with a combination of biotinylated anti-CD3ε mAb 2C11 and streptavidin at 37°C for the indicated periods. The cell lysates were prepared and immunoprecipitated with antisera specific for Zap70. The immunoprecipitates were subjected to reducing SDS-PAGE followed by Western blotting with anti-phosphotyrosine (αpTyr) mAb 4G10 (upper). Results are representative of three independent experiments. The blot was stripped and subsequently immunoblotted with Zap70 rabbit antisera with only the area of the Zap70 band shown (lower). The migration position of Zap70 in the αpTyr blot is indicated by an arrow. B, IL-2 production induced by specific pMHCI in N15wt and variant TCR bearing cells. For activation, H-2Kb+ R8 cells (used as APCs) were loaded with 10−9–10−4 M VSV8 peptide. Mean ± SD of triplicate samples are indicated. Results are representative of four separate experiments. Consistent with the inability of anti-CD3ε mAb to stimulate tyrosine phosphorylation in N15βΔFG-expressing T cells, the N15ΔFG transfectants generate little IL-2 upon either 2C11 or 7D6 mAb cross-linking (data not shown). The profound defect in TCR signaling in the βΔFG mutants is also observed when T cells are triggered by a specific peptide-MHC complex (pMHC). In the case of N15βΔFG, detectable IL-2 production upon stimulation by VSV8 peptide-pulsed R8 cells requires 10 μM VSV8 compared with the 1 nM concentration required to stimulate N15wt (Fig. 8⇑B). Unlike βΔFG, the N15N236A variant is but slightly less responsive (≤10-fold) than the N15wt cells. This reduction in IL-2 production by N15ΔFG is clearly a consequence of the Cβ FG loop deletion because each of the lines generates equivalent amounts of IL-2 upon calcium ionophore and PMA stimulation (data not shown). To confirm the signaling defect in primary T cells, we used N15αβ RAG-2−/− and N15α,βΔFG RAG-2−/− animals as described in Materials and Methods. As shown in Fig. 9⇓, there is a reduction in phosphorylation of Erk1/2 MAPK upon in vitro cognate peptide stimulation of LN T cells from N15α,βΔFG RAG-2−/− as compared with N15αβ RAG-2−/− mice. Note that T cells from these two strains of mice express equivalent levels of TCR as shown in Fig. 9⇓A. Thus, the βΔFG mutation disrupts TCR signaling leading to Erk1/2 phosphorylation. 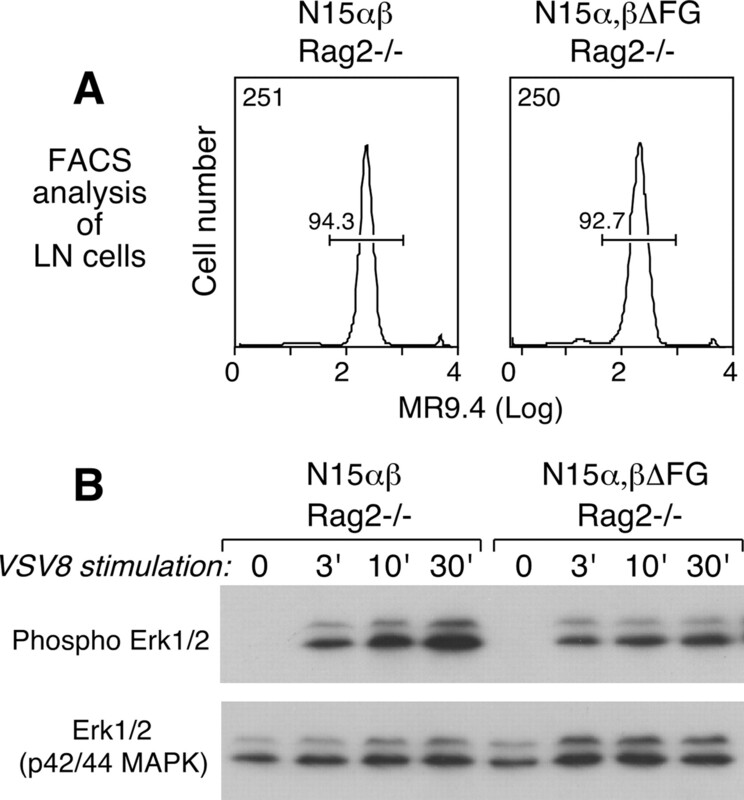 Reduced Erk phosphorylation upon stimulation by cognate peptide in N15α,βΔFG RAG-2−/− vs N15αβ RAG-2−/− T cells. A, LN cells from N15αβ RAG-2−/− and N15α,βΔFG RAG-2−/− mice were analyzed for TCR expression by FACS with the anti-Vβ5 Ab, MR9.4. The percentages of MR9.4+ T cells in total LN cells are given. Numbers in the upper left corner of the histograms are the mean fluorescence intensities. B, LN T cells from N15αβ RAG-2−/− and N15α,βΔFG RAG-2−/− mice were stimulated with 10−5 M VSV8 peptide for the indicated minutes, lysed, and analyzed for phospho Erk1/2 (upper panel) and total Erk1/2 (lower panel). Earlier studies from this laboratory suggested that deletion of the rigid Cβ FG loop in a mutant transgene using the β subunit of the N15 CTL did not block murine thymocyte development (26). Instead, this deletion was associated with an altered Vα repertoire in N15βΔFG tg mice compared with N15βwt tg mice. Given that such a Vα repertoire might be a consequence of long-term biological compensation for the effect of the Cβ FG loop deletion in these animals, we crossed N15αβTCR tg RAG-2−/− with N15βΔFG tg RAG-2−/− mice, generating N15αβRAG-2−/− and N15αβ.βΔFG RAG-2−/− littermates. The latter had equivalent numbers of N15 TCRs per T cell as the former. However, only 50% were N15αβwt with the remainder being N15αβΔFG-expressing TCRs. Such animals showed an ∼10-fold increase in DP thymocytes with diminished constitutive- and cognate-peptide-induced apoptosis, arguing that the Cβ FG loop may be important in deletion (26). Although we postulated that N15αβΔFG TCRs may disregulate N15αβwt TCRs expressed on the same thymocytes through activation of inhibitory pathways (i.e., phosphatases) in the absence of productive stimulation, this notion remains to be proven. In the present study, we have independently characterized the importance of the Cβ FG loop in thymocyte development of αβ T cells using N15βwt and N15βΔFG tg B6 mice. For this purpose, we used multicolor flow cytometry analysis and competitive adoptive transfer studies to reveal that removal of the loop favors the survival of αβ thymocytes at all stages of intrathymic development. Collectively, these data suggest that removal of the Cβ FG loop dramatically attenuates negative selection without preventing positive selection. Competitive thymic reconstitution by adoptive transfer of BM cells from N15βwt and N15βΔFG tg mice allows direct comparison of the developmental potential of thymocytes expressing βΔFG vs βwt subunits. As shown in Fig. 2⇑ and Table I⇑, N15βΔFG-bearing cells predominate over N15βwt-expressing cells in all thymic subpopulations and in the peripheral CD8+ population in mixed βwt and βΔFG tg chimeras using Ly5 congenic or RAG-2−/− recipient hosts. These data are directly reflective of the advantage of the βΔFG-expressing over the βwt-expressing thymocytes in development. Based on our observation that there is reduced negative selection in N15αβ.βΔFG RAG-2−/− compared with N15αβ RAG-2−/− mice (26), the βΔFG mutation must reduce cell death during thymic development even in β-chain tg thymocytes in which the β-chain pairs with multiple endogenous α-chains. In this regard, earlier in vivo BrdU labeling showed no difference in DNA synthesis among βwt- and βΔFG tg-expressing thymocytes (26). Thus, the increase in DP thymocyte populations is not because of enhanced proliferation but rather reduced negative selection. Negative selection requires a relatively strong TCR ligation (36). A reduction in cell death in βΔFG mice suggests that TCRs containing the βΔFG subunit are less effective at signal transduction than those containing the βwt subunit. T cells of the αβ lineage mature through DP and SP stages that are associated with stringent selection events (3, 37). In contrast, some T cells of the γδ lineage do not appear to be negatively selected in the thymus, but rather positively selected on cognate self-Ags (38). αβ T cells differ from γδ T cells in usage of CD3δ (10), p56lck (39), linker for activation of T cells (40), Vav (41), and p38 (42) among other signaling pathways. The crystal structure of human and murine γδTCRs shows that the human Cγ FG loop is 12 residues shorter than the Cβ FG loop, packing close to the core of the Cγ domain (43, 44). Hence, if the Cβ FG loop represents a key TCR structural component for negative selection, then its essential absence in Cγ explains, at least in part, why some γδTCRs are not negatively selected in the thymus. Pre-TCR expression at the level of DN thymocytes (DN3) promotes αβTCR development but not γδTCR development (45). In fact, pTα−/− mice are characterized by an excess number of γδ cells (45). We further examined the effect of the FG loop deletion in pre-TCR function using N15βwt RAG-2−/− and N15βΔFG RAG-2−/− models since the CD3εγ heterodimer is thought to bind to a similar cave in the pre-TCR formed by Cβ and pTα ectodomains (22). The RAG-2−/− background allows clonal analysis of pre-TCR function more readily than RAG-2+/+ or RAG-2+/− for two reasons. First, endogenous α-chains cannot be expressed; hence, all β-chains associate with pTα rather than α-chains (46). Second, a function of the pre-TCR is to signal productive β-chain rearrangement, terminating further recombination machinery activity and resulting in β-chain allelic exclusion (8). If the βΔFG chain has less signaling capacity than βwt, then a pre-TCR incorporating a βΔFG subunit may not shut off rearrangements as efficiently as one incorporating βwt. In the presence of the βΔFG transgene, there may be more endogenous β-chain expression than in the βwt tg thymocytes (in the RAG-2+/+ or RAG+/− backgrounds). Assuming these endogenous β-chains are incorporated into pre-TCRs, then the role of the FG loop in the DN3 to DN4 transition may be obscured in B6 mice. This possibility is supported by the observation of increasing endogenous β-chain expression in aged N15βΔFG mice compared with N15βwt mice (MR9.4 cells are 96.3 ± 2.3% of βwt CD8+ cells, 90.3 ± 4.7% of βΔFG CD8+ T cells, 60.7 ± 10.5% βwt CD4+ cells; and 39.9 ± 9.5% βΔFG CD4+ cells in 8- to 10-mo-old mice). Furthermore, simultaneous staining of DP and SP thymocytes for Vβ8 (endogenous) and Vβ5 (tg) expression shows that the Vβ8:Vβ5 ratio is 2-fold higher in βΔFG than in βwt tg thymocytes consistent with reduced allelic exclusion in the βΔFG tg mice (data not shown). In the RAG-2−/− background, however, no endogenous β-chain rearrangement is possible. Thus, the lack of an efficient pre-TCR signal in βΔFG-expressing thymocytes is revealed as a partial block in the DN3 to DN4 transition. Nonetheless, developmental progression from DN4 to the DP thymocyte stage is not blocked as the number of DP thymocytes on the RAG-2−/− background is equivalent in βwt and βΔFG tg mice (Ref. 26 and data not shown). The functional capacity of the βΔFG subunit incorporated into the TCR of mature T cells was assayed using N15βwt and N15βΔFG tg mice. Consistent with our previous work (26), impaired functions of βΔFG T cells were detected in mitogen- or alloantigen-induced proliferative assays and in cytokine production studies (Figs. 4⇑ and 5⇑). Such a reduction in function was also observed in αβTCR transfectants. The IL-2 production induced by the VSV8 cognate peptide in N15αβΔFG transfectants was reduced dramatically. Ten thousand-fold higher concentrations of VSV8 were required to stimulate comparable IL-2 production from N15αβΔFG transfectants vs N15αβwt transfectants. Functional activity of another Kb-restricted TCR, termed N26 (28), was similarly reduced by deletion of the Cβ FG loop (data not shown). In transfectants expressing the 14.3.d TCR (Vβ8.2-Jβ2.1 and Vα4-Jα47) specific for HA110–119 PR8 influenza hemagglutinin peptide complexes bound by I-Ed, deletion of the Cβ FG loop resulted in a lower response to stimulation with HA110–119 or SEC3 superantigen (24). Collectively, these findings imply that the Cβ FG loop augments mature T cell signaling in both CD4 and CD8 TCR αβ T cells. Prior mAb mapping studies identified one of the two CD3ε subunits in the αβTCR complex as lying in close proximity to the TCR Cβ chain FG loop (23), forming a side wall of the cavity into which CD3ε inserts or otherwise docks. This FG loop presumably stabilizes the interaction between CD3ε and the TCRαβ heterodimer. To test this possibility, we immunoprecipitated with the anti-CD3εγ mAb 7D6 from N15αβwt and N15αβΔFG TCR transfectants. The results support our hypothesis because deletion of the loop weakens the association between CD3εγ and TCRαβ and results in less signaling via the TCR, noted as a reduction in tyrosine phosphorylation of cellular substrates (Figs. 7–9⇑⇑⇑). T cell recognition requires that a TCR bind a specific pMHC ligand and that information on receptor occupancy is relayed to the cytoplasmic tails of the CD3 components. Subsequently, the ITAMs of the CD3 cytoplasmic tail are phosphorylated by tyrosine kinases leading to further downstream signaling events (47). The diminished tyrosine phosphorylation following TCR triggering in N15αβΔFG transfectants relative to N15αβwt transfectants argues that the Cβ FG loop may be a key transducer to relay a physical pMHC ligation event to the CD3 subunits, in particular the CD3εγ heterodimer. In our view, the rigidity of the Cα-Cβ and Vβ-Cβ interfaces in conjunction with the FG loop facilitates the transfer of a physical force of pMHC binding from the TCR variable domains to the TCR constant domain module and then onward to the transmembrane and cytoplasmic segments. The recent structures of TCRαβ, CD3εγ, and CD3εδ heterodimers have permitted us to construct a first plausible model for the topology of the TCR ectodomain assembly (35, 48). In this view, the TCRαβ chains are supported by the CD3 heterodimers such that the Cβ FG loop on the “right-hand side” and the α-connecting peptide between Cα and the α-transmembrane (TM) segment on the “left-hand side” (49, 50) control movements for signal transduction via the various TM segments. Dynamic quaternary changes following TCR ligation are postulated to effect the TCR signaling segments, especially in view of the apparent weak ectodomain association between TCRαβ and CD3 heterodimers. There are two clusters of TM segments: the five helices of the CD3ε-CD3δ-TCRα-CD3ζ-CD3ζ component closer to the TCRα subunit on the left and the three helices of the CD3ε-CD3γ-TCRβ component closer to the TCRβ subunit on the right. The left cluster has eight cytoplasmic ITAMs, one in CD3ε, one in CD3δ, and three in each CD3ζ subunit, whereas the right cluster has two ITAMs, one in CD3ε and one in CD3γ. Because negative selection involves the strongest self-pMHC ligand interactions, requiring maximal signals to stimulate apoptosis, it is easy to envision how the Cβ FG loop deletion might attenuate negative selection. Likewise, because pre-TCR signaling primarily relies on the right cluster given that pTα, the α-chain surrogate, lacks a V domain, an effect of the Cβ FG loop deletion is anticipated. In contrast, weak TCR-mediated signals are sufficient to stimulate positive selection. Positively selecting ligands bind to TCRs with low affinity and, hence, either a CD3δ deletion or α-connecting peptide deletion disrupts the left cluster, blocking positive selection (17, 49). On the other hand, attenuation of signaling on the right cluster via Cβ FG loop deletion does not block positive selection. Instead, αβTCRs incorporating a βΔFG subunit appear to generate a greater number of SP thymocytes (Figs. 1⇑ and 2⇑; Table I⇑) presumably by preserving the “left-sided” signaling cluster while attenuating the “right-sided” cluster that otherwise might foster negative selection through coordinate engagement of all 10 ITAMs. N15α,βΔFG tg mice on both a RAG-2−/− or Cα−/− background show an increase in the total numbers of thymocytes and DP thymocytes compared with N15α,βwt tg mice. Furthermore, the N15αβΔFG tg mice show an ∼2-fold increase in the absolute number of CD8+ SP thymocytes (our unpublished results). In summary, aside from assisting with pre-TCR activity, we believe that a primary function of the Cβ FG loop in the thymus is to facilitate negative selection in DP thymocytes. In the absence of the FG loop, such self-reactive T cells might not be purged from the repertoire. The Cβ FG loop may also play a role in deletion of DN3 thymocytes via pre-TCR-pMHC interaction, should this occur. As positive selection is more dependent on the α side of the TCR complex, positive selection remains largely unperturbed by the Cβ FG loop deletion. Following maturation, αβ T cells are dependent on the Cβ FG loop to augment sensitivity for cognate peptide recognition. That some γδ T cells appear not to undergo negative selection and manifest strong ligand signaling (51) may offer an explanation for the absence of a comparable appendage on Cγ. We thank Drs. John E. Connolly and Jacque Banchereau for Luminex cytokine assays and Dr. Jia-huai Wang for assisting with comparison of TCRγ and TCRβ FG loops. ↵1 This work was supported by National Institutes of Health Grants AI19807 and AI45789. ↵3 Abbreviations used in this paper: DN, double negative; DP, double positive; tg, transgenic; βΔFG, TCRβ-chain in which the FG loop was deleted; βwt, wild-type TCR β-chain; BM, bone marrow; LN, lymph node; SP, single positive; pMHC, peptide-MHC complex; TM, transmembrane. Baniyash, M.. 2004. TCRζ chain down-regulation: Curtailing an excessive inflammatory immune response. Nat. Rev. Immunol. 4: 675-687. Wang, J.-H., E. L. Reinherz. 2002. Structural basis of T cell recognition of peptides bound to MHC molecules. Mol. Immunol. 38: 1039-1049. Hogquist, K. A., T. A. Baldwin, S. C. Jameson. 2005. Central tolerance: learning self-control in the thymus. Nat. Rev. Immunol. 5: 772-782. Saint-Ruf, C., K. Ungewiss, M. Groettrup, L. Bruno, H. J. Fehling, H. von Boehmer. 1994. Analysis and expression of a cloned pre-T cell receptor gene. Science 266: 1208-1212.
von Boehmer, H.. 2005. Unique features of the pre-T cell receptor α-chain: not just a surrogate. Nat. Rev. Immunol. 5: 571-577. Aifantis, I., J. Buer, H. von Boehmer, O. Azogui. 1997. Essential role of the pre-T cell receptor in allelic exclusion of the T cell receptor β locus. Immunity 7: 601-607. Krotkova, A., H. von Boehmer, H. J. Fehling. 1997. Allelic exclusion in pTα-deficient mice: no evidence for cell surface expression of two T cell receptor (TCR)-β chains, but less efficient inhibition of endogeneous Vβ→(D)Jβ rearrangements in the presence of a functional TCR-β transgene. J. Exp. Med. 186: 767-775.
von Boehmer, H., H. J. Fehling. 1997. Structure and function of the pre-T cell receptor. Annu. Rev. Immunol. 15: 433-452. Trop, S., M. Rhodes, D. L. Wiest, P. Hugo, J. C. Zuniga-Pflucker. 2000. Competitive displacement of pTα by TCR-α during TCR assembly prevents surface coexpression of pre-TCR and αβ TCR. J. Immunol. 165: 5566-5572. Hayes, S. M., E. W. Shores, P. E. Love. 2003. An architectural perspective on signaling by the pre-, αβ and γδ T cell receptors. Immunol. Rev. 191: 28-37. DeJarnette, J. B., C. L. Sommers, K. Huang, K. J. Woodside, R. Emmons, K. Katz, E. W. Shores, P. E. Love. 1998. Specific requirement for CD3ε in T cell development. Proc. Natl. Acad. Sci. USA 95: 14909-14914. Malissen, M., A. Gillet, L. Ardouin, G. Bouvier, J. Trucy, P. Ferrier, E. Vivier, B. Malissen. 1995. Altered T cell development in mice with a targeted mutation of the CD3ε gene. EMBO J. 14: 4641-4653. Haks, M. C., P. Krimpenfort, J. Borst, A. M. Kruisbeek. 1998. The CD3γ chain is essential for development of both the TCRαβ and TCRγδ lineages. EMBO J. 17: 1871-1882. Liu, C. P., R. Ueda, J. She, J. Sancho, B. Wang, G. Weddell, J. Loring, C. Kurahara, E. C. Dudley, A. Hayday, et al 1993. Abnormal T cell development in CD3-ζ−/− mutant mice and identification of a novel T cell population in the intestine. EMBO J. 12: 4863-4875. Love, P. E., E. W. Shores, M. D. Johnson, M. L. Tremblay, E. J. Lee, A. Grinberg, S. P. Huang, A. Singer, H. Westphal. 1993. T cell development in mice that lack the ζ chain of the T cell antigen receptor complex. Science 261: 918-921. Malissen, M., A. Gillet, B. Rocha, J. Trucy, E. Vivier, C. Boyer, F. Kontgen, N. Brun, G. Mazza, E. Spanopoulou, et al 1993. T cell development in mice lacking the CD3-ζ/η gene. EMBO J. 12: 4347-4355. Dave, V. P., Z. Cao, C. Browne, B. Alarcon, G. Fernandez-Miguel, J. Lafaille, A. de la Hera, S. Tonegawa, D. J. Kappes. 1997. CD3δ deficiency arrests development of the αβ but not the γδ T cell lineage. EMBO J. 16: 1360-1370. Wilson, A., H. R. MacDonald. 1995. Expression of genes encoding the pre-TCR and CD3 complex during thymus development. Int. Immunol. 7: 1659-1664. Bentley, G. A., G. Boulot, K. Karjalainen, R. A. Mariuzza. 1995. Crystal structure of the β chain of a T cell antigen receptor. Science 267: 1984-1987. Garboczi, D. N., P. Ghosh, U. Utz, Q. R. Fan, W. E. Biddison, D. C. Wiley. 1996. Structure of the complex between human T cell receptor, viral peptide and HLA-A2. Nature 384: 134-141. Garcia, K. C., M. Degano, R. L. Stanfield, A. Brunmark, M. R. Jackson, P. A. Peterson, L. Teyton, I. A. Wilson. 1996. An αβ T cell receptor structure at 2.5Å and its orientation in the TCR-MHC complex. Science 274: 209-219. Wang, J., K. Lim, A. Smolyar, M.-K. Teng, J.-H. Liu, A. G. T. Tse, J. Liu, R. E. Hussey, Y. Chishti, C. T. Thomson, et al 1998. Atomic structure of an αβ T cell receptor (TCR) heterodimer in complex with an anti-TCR Fab fragment derived from a mitogenic antibody. EMBO J. 17: 10-26. Ghendler, Y., A. Smolyar, H.-C. Chang, E. L. Reinherz. 1998. One of the CD3ε subunits within a T cell receptor complex lies in close proximity to the Cβ FG loop. J. Exp. Med. 187: 1529-1536. Degermann, S., G. Sollami, K. Karjalainen. 1999. T cell receptor β chain lacking the large solvent-exposed Cβ FG loop supports normal α/β T cell development and function in transgenic mice. J. Exp. Med. 189: 1679-1684. Degermann, S., G. Sollami, K. Karjalainen. 1999. Impaired NK1.1 T cell development in mice transgenic for a T cell receptor β chain lacking the large, solvent-exposed Cβ FG loop. J. Exp. Med. 190: 1357-1362. Sasada, T., M. Touma, H. C. Chang, L. K. Clayton, J. H. Wang, E. L. Reinherz. 2002. Involvement of the TCR Cβ FG loop in thymic selection and T cell function. J. Exp. Med. 195: 1419-1431. Ghendler, Y., R. E. Hussey, T. Witte, E. Mizoguchi, L. K. Clayton, A. K. Bhan, S. Koyasu, H. C. Chang, E. L. Reinherz. 1997. Double positive T cell receptor high thymocytes are resistant to peptide/major histocompatibility complex ligand-induced negative selection. Eur. J. Immunol. 27: 2279-2289. Chang, H.-C., A. Smolyar, R. Spoerl, T. Witte, Y. Yao, E. C. Goyarts, S. G. Nathenson, E. L. Reinherz. 1997. Topology of T cell receptor-peptide/class I MHC interaction defined by charge reversal complementation and functional analysis. J. Mol. Biol. 271: 278-293. Koyasu, S., A. G. D. Tse, P. Moingeon, R. E. Hussey, A. Mildonian, J. Hannisian, L. K. Clayton, E. L. Reinherz. 1994. Delineation of a T cell activation motif required for binding of protein tyrosine kinases containing tandem SH2 domains. Proc. Natl. Acad. Sci. USA 91: 6693-6697. Sunder-Plassmann, R., F. Lialios, M. Madsen, S. Koyasu, E. L. Reinherz. 1997. Functional analysis of immunoreceptor tyrosine-based activation motif (ITAM)-mediated signal transduction: the two YxxL segments within a single CD3ζ-ITAM are functionally distinct. Eur. J. Immunol. 27: 2001-2009. Wang, F., T. Ono, A. M. Kalergis, W. Zhang, T. P. DiLorenzo, K. Lim, S. G. Nathenson. 1998. On defining the rules for interactions between the T cell receptor and its ligand: a critical role for a specific amino acid residue of the T cell receptor β chain. Proc. Natl. Acad. Sci. USA 95: 5217-5222. Chang, H.-C., Z.-Z. Bao, Y. Yao, A. G. D. Tse, E. C. Goyarts, M. Madsen, E. Kawasaki, P. P. Brauer, J. C. Sacchettini, S. G. Nathenson, E. L. Reinherz. 1994. A general method for facilitating heterodimeric pairing between two proteins: application to expression of α and β T cell receptor extracellular segments. Proc. Natl. Acad. Sci. USA 91: 11408-11412. Kubo, R. T., W. Born, J. W. Kappler, P. Marrack, M. Pigeon. 1989. Characterization of a monoclonal antibody which detects all murine αβ T cell receptors. J. Immunol. 142: 2736-2742. Balomenos, D., R. S. Balderas, K. P. Mulvany, J. Kaye, D. H. Kono, A. N. Theofilopoulos. 1995. Incomplete T cell receptor Vβ allelic exclusion and dual Vβ expressing cells. J. Immunol. 155: 3308-3312. Sun, Z.-Y. J., K. S. Kim, G. Wagner, E. L. Reinherz. 2001. Mechanisms contributing to T cell receptor signaling and assembly revealed by the solution structure of an ectodomain fragment of the CD3εγ heterodimer. Cell 105: 913-923. Alam, S. M., P. J. Travers, J. L. Wung, W. Nasholds, S. Redpath, S. C. Jameson, N. R. Gascoigne. 1996. T cell receptor affinity and thymocyte positive selection. Nature 381: 616-620. Cho, H. J., S. G. Edmondson, A. D. Miller, M. Sellars, S. T. Alexander, S. Somersan, J. A. Punt. 2003. Identification of the targets of clonal deletion in an unmanipulated thymus. J. Immunol. 170: 10-13. Pennington, D. J., B. Silva-Santos, A. C. Hayday. 2005. γδ T cell development—having the strength to get there. Curr. Opin. Immunol. 17: 108-115. Saint-Ruf, C., M. Panigada, O. Azogui, P. Debey, H. von Boehmer, F. Grassi. 2000. Different initiation of pre-TCR and γδTCR signalling. Nature 406: 524-527. Nunez-Cruz, S., E. Aguado, S. Richelme, B. Chetaille, A. M. Mura, M. Richelme, L. Pouyet, E. Jouvin-Marche, L. Xerri, B. Malissen, M. Malissen. 2003. LAT regulates γδ T cell homeostasis and differentiation. Nat. Immunol. 4: 999-1008. Swat, W., R. Xavier, A. Mizoguchi, E. Mizoguchi, J. Fredericks, K. Fujikawa, A. K. Bhan, F. W. Alt. 2003. Essential role for Vav1 in activation, but not development, of γδ T cells. Int. Immunol. 15: 215-221. Mulroy, T., J. Sen. 2001. p38 MAP kinase activity modulates α β T cell development. Eur. J. Immunol. 31: 3056-3063. Adams, E. J., Y. H. Chien, K. C. Garcia. 2005. Structure of a γδ T cell receptor in complex with the nonclassical MHC T22. Science 308: 227-231. Allison, T. J., C. C. Winter, J. J. Fournie, M. Bonneville, D. N. Garboczi. 2001. Structure of a human γδ T cell antigen receptor. Nature 411: 820-824. Aifantis, I., O. Azogui, J. Feinberg, C. Saint-Ruf, J. Buer, H. von Boehmer. 1998. On the role of the pre-T cell receptor in αβ versus γδ T lineage commitment. Immunity 9: 649-655. Baldwin, T. A., M. M. Sandau, S. C. Jameson, K. A. Hogquist. 2005. The timing of TCRα expression critically influences T cell development and selection. J. Exp. Med. 202: 111-121. Weiss, A., D. R. Littman. 1994. Signal transduction by lymphocyte antigen receptors. Cell 76: 263-274. Sun, Z. Y., S. T. Kim, I. C. Kim, A. Fahmy, E. L. Reinherz, G. Wagner. 2004. Solution structure of the CD3εδ ectodomain and comparison with CD3εγ as a basis for modeling T cell receptor topology and signaling. Proc. Natl. Acad. Sci. USA 101: 16867-16872. Bäckström, B. T., U. Müller, B. Hausmann, E. Palmer. 1998. Positive selection through a motif in the αβ T cell receptor. Science 281: 835-838. Werlen, G., B. Hausmann, E. Palmer. 2000. A motif in the αβ T cell receptor controls positive selection by modulating ERK activity. Nature 406: 422-426. Hayes, S. M., L. Li, P. E. Love. 2005. TCR signal strength influences αβ/γδ lineage fate. Immunity 22: 583-593. Vol. 176 No. 11.